Anna Maria van Schurman is readily considered the most highly educated woman of the 17th century. She questioned the role that women should play in Dutch society, and her determination to receive an education, along with her achievements, made her stand out from other women of her time. Her radical belief that women should be educated to receive an education, not just for a professional purpose or for employment, was controversial and differed from other 17th century arguments for the education of women. Van Schurman received a strong classical education from her father. Considered a child prodigy, she could freely read and translate both Latin and Greek by the age of seven and had learned German, French, Hebrew, English, Spanish, and Italian by age eleven. She also studied art and became a distinguished artist in the fields of drawing, painting, and etching, though few examples of her art exist today. At the age of 29, after years of advocating for women’s education, van Schurman was invited to attend the University of Utrecht as the first female student. The administration required that she sit behind a curtain in class, as they believed she would distract the male students. She graduated with a degree in law—the first female graduate. Van Schurman spent much of her adult life writing on the importance of equal education for women, publishing the majority of her works in the 1640s and 50s. In her book Whether the Study of Letters is Fitting for a Christian Woman, published in 1646, she stated that anyone with ability and principles should be allowed to be educated. She believed women should receive an education in all subjects, so long as it did not interfere with their domestic duties. She actively published articles detailing the ways in which women’s brains functioned as effectively as men’s, and the damage that occurred to women’s abilities if they were only considered capable of being wives and mothers. She participated in contemporary intellectual discourse, communicating with important cultural figures, such as the philosopher René Descartes, philosopher Marin Mersenne, and writer Constantin Huygens. Toward the end of her life, she became involved in a contemplative religious sect founded by the Jesuit Jean de Labadie. Labadism was a mystic offshoot of Catholicism that preached the importance of communal property and included the directive to raise children communally. Van Schurman became de Labadie’s primary assistant and followed the sect as it traveled. His support enabled her to publish her final book Eucleria, arguably the most thorough explanation of Labadism, in 1673. Anna Maria van Schurman’s plate is painted with many thin lines, referencing popular Dutch etchings of the 17th century. 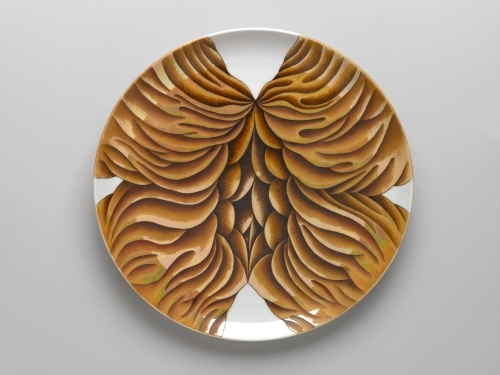 Chicago chose an abstracted butterfly form for the plate, a symbol of “Anna’s valiant efforts on behalf of women’s rights” (Chicago, The Dinner Party, 100). The colors of the plate, shades of orange, complement the colors of the runner, which is embroidered in a style that was common in 17th century Holland. 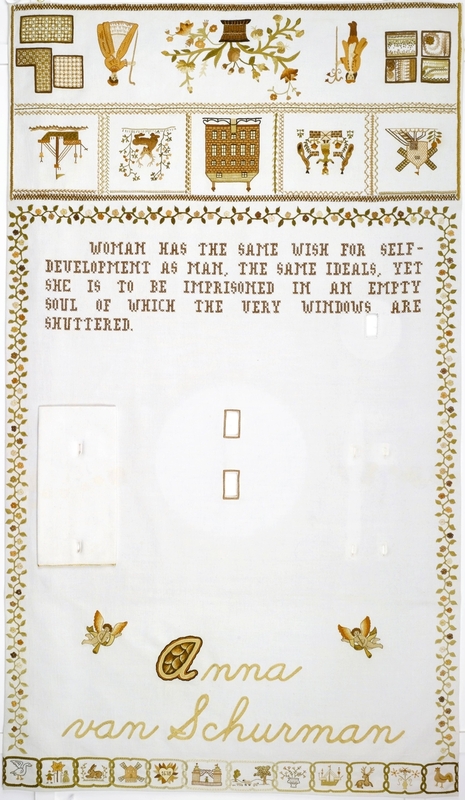 Young girls practiced these tiny stitches on samplers, which were meant to teach them the virtues of womanhood, such as docility and obedience. The needlework represents the educational limits of van Schurman’s Dutch counterparts (Chicago, Embroidering Our Heritage, 176) and shows how girls were forced to “think small” during this period (Chicago, The Dinner Party, 83). The runner is patterned on early stitch samplers; on the back is an embroidered flower basket, a common motif in Dutch samplers that signified renewal. The rabbit, also a sampler motif, represented timidity. 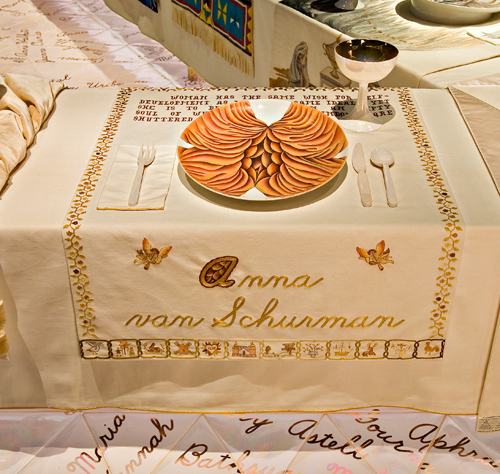 These images of domesticity are offset by the embroidered angels flanking van Schurman’s name, which reflect her role as a religious leader. Woman has the same erect countenance as man, the same ideals, the same love of beauty, honor and truth, the same wish for self-development, and yet she is to be imprisoned in an empty soul of which the very windows are shuttered. De Vitae Humanae Termino (medical ethics textbook), 1639. The Learned Maid (or Whether a Maid May Be a Scholar or Whether the Study of Letters is Fit for a Christian Woman), 1641.
de Baar, Mirjam, ed. Choosing the Better Part: Anna Maria van Schurman (1607– 1678). Translated from the Dutch by Lynn Richards. Dordrecht and Boston: Kluwer Academic Publishers, 1995. Couchman, Jane, and Ann Crabb, eds. Women’s Letters Across Europe, 1400–1700: Form and Persuasion. Aldershot, UK and Burlington, Vt.: Ashgate, 2005. Dykeman, Therese Boos, ed. The Neglected Canon: Nine Women Philosophers, First to the Twentieth Century. Dordrecht: Kluwer Academic Publishers, 1999. Irwin, Joyce, ed. Anna Maria van Schurman: Whether a Christian Woman Should Be Educated and Other Writing from Her Intellectual Circle. Chicago: University of Chicago Press, 1999. Kersey, Ethel M. Women Philosophers: A Bio-Critical SourceBook. New York: Greenwood Press, 1989. Wilson, Katharina M., and Frank J. Wamke, eds. Women Writers of the Seventeenth Century. Athens, Ga.: University of Georgia Press, 1989. Zedler, Beatrice H., trans. The History of Women Philosophers by Gilles Menage (1613-1692). Lanham, Md. : The University Press of America, 1984.